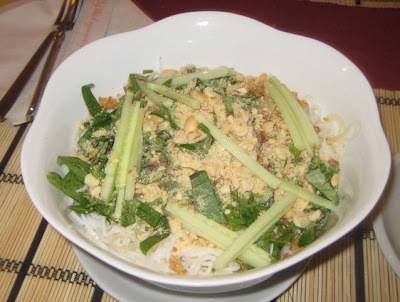 For such a small and unassuming spot, there's been a big buzz around the relatively new Vietnamese restaurant, Ha Noi. 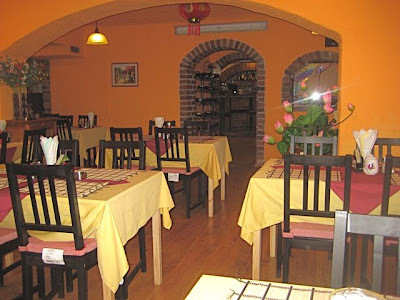 The Vinohrady establishment got some positive mentions by long-time Prague restaurant critic Evan Rail on the pages of The New York Times and Lidové noviny. 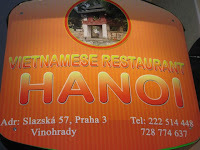 He mentions the surprising lack of Vietnamese restaurants in Prague, given the large Vietnamese population in the city. 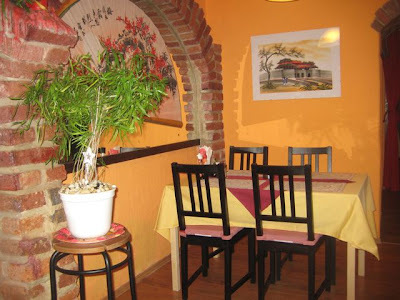 It's also noted that on Expats.cz, a discussion of the restaurant's pho, or noodle soup, is filled with comments like "pretty good - not quite Vietnamese standard" and "best I've had in Prague" and "bargain for that quality." 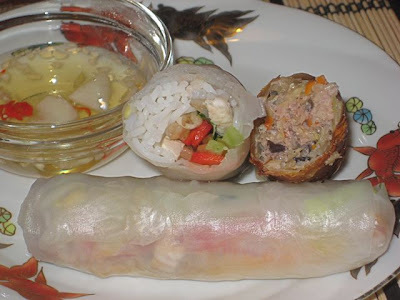 However, Ha Noi was essentially panned by Pan Cuketka, the popular food blogger and reviewer at Týden magazine (Czech only). He basically said Prague is still waiting for a good and authentic Vietnamese restaurant. I enjoy a variety of Asian cuisines, but like many out there, I'm not an expert on Vietnamese food. I'm just a guy who eats out a lot and loves trying new things. And after three visits, I've got my own opinions. Despite being in a cellar space, the room is bright and cheerful enough, with brick accents, orange walls, blond wood floors, and yellow table cloths. 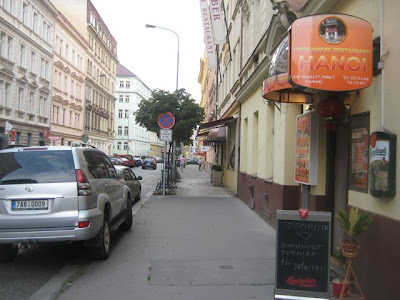 On my first visit with V, I went straight for the pho bo or beef noodle soup (79 CZK). It was stocked with paper-thin slices of meat that were surprisingly tender. Noodles floated underneath. 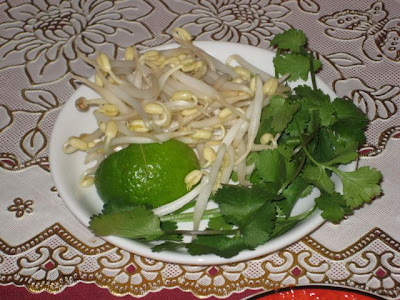 On the side were a lime slice, cilantro, and bean sprouts. There was also a potion of vinegar, garlic slices, and red, hot chili peppers. There were so many of my favorite flavors here. However, I felt that they were not assertive enough. Perhaps an authentic version has a slight blandness to it. But for my tastes, it didn't cause much excitement. I wished there was more lime, and I added a lot of the garlic potion to give it more of a punch. Don't get me wrong. It wasn't bad. I just didn't find it particularly special. This first meal was a few months ago, and it was before Ha Noi came out with its one-page Vietnamese menu. 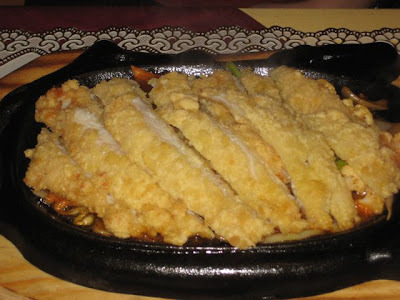 So V ordered something from the regular Chinese menu -- sweet and sour chicken on an iron skillet. This was pretty dismal. For some reason, she thought that since it was served on hot iron, it wouldn't be fried in batter. A simple misunderstanding. However, the crust was really unfortunate. It had an odd and unpleasant consistency, somewhere closer to chewy than crunchy. The chicken slices rested on vegetables and there was a standard sweet and sour sauce on the side. 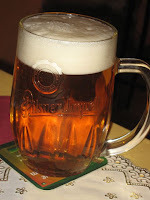 I was drinking Pilsner Urquell. The great news here was a half-liter was only 26 CZK. It tasted good, though I do like it a little colder. On my second, more recent visit, I started off with two kinds of spring rolls. They have the classic fried roll, like the one on the right, filled with pork, shredded cabbage, and carrot (49 CZK for three). They also offered one free when ordering a main course. But the rolls listed on the menu as "nem ga" said in Czech they were made with chicken. 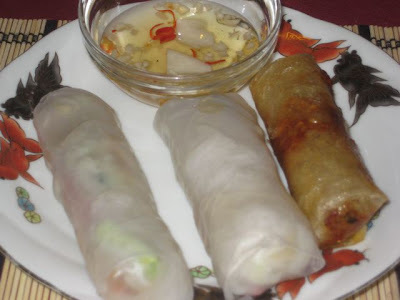 There were also fried rolls made with just rice noodles called "bun nem." There were no fried rolls listed with pork. 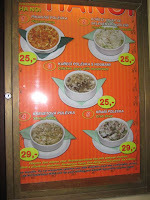 At the bottom of the Vietnamese menu, they listed non-fried spring rolls (29 CZK each). Inside, there were shrimp, rice noodles, Thai basil, red pepper, cucumber, and what I believed was chicken. But the menu said it was pork. The dipping sauce was sweet, but also quite spicy. Then, I went for a dish that a few people recommended, the bun cha (79 CZK). 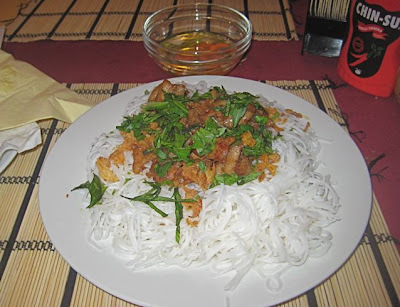 This was roasted pork with torn Thai-style basil leaves over plain rice noodles. There was a sweet and sour sauce on the side. 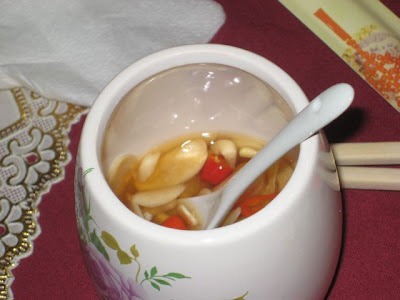 The New York Times piece mentioned that it came with bird chilies and peanuts but I didn't see those. The pork itself was slightly overcooked and tough. Pan Cuketka called the meat "intolerably salty." I wouldn't go that far, but it was definitely on the wrong side of the salinity scale. Like him, I also thought I tasted soy sauce, which is not part of the classic bun cha recipe. Most recipes also call for a decent amount of sugar, which I had a hard time detecting. I poured all of the sweet sauce over the top to cut the salinity and give the noodles some flavor. It helped, but not enough. Still, I felt that with better attention to detail in the cooking and flavor, the dish had potential. 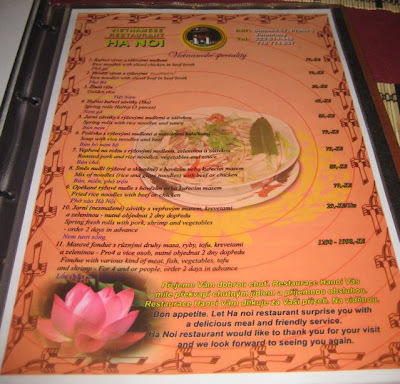 I felt I didn't have the full measure of the Vietnamese menu, so I went back one more time. 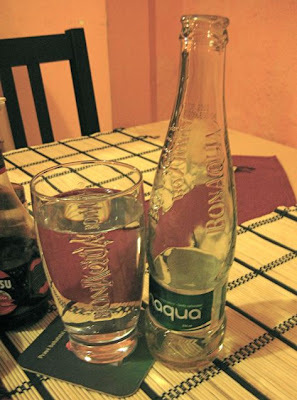 I ordered a bottle of water and was disappointed to see they have those .2 liter bottles of Bonaqua (20 CZK). I much prefer Mattoni. Those tiny Bonaqua bottles don't quench my thirst. For my meal, I had the mixed rice and glass noodles with beef (89 CZK). There was crushed peanut, cucumber, and basil on top. Under the noodles, there was a sweet sauce that turned into a nice broth. The waiter encouraged me to mix it up well. The meat was tender and had the best balance, not over salted. I wished there was more of it. I thought I'd even ask for a double order of meat over a single order of noodles. I'd pay 178 CZK for that. 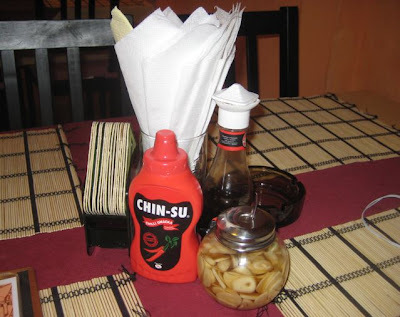 I did add some Chin-su hot sauce to perk it up. But even without that, I liked this the best of all the dishes I tried. Warning -- that red chili sauce is hot stuff. The service was always good -- polite, friendly, and efficient. The food always came fast. Maybe too fast. I was concerned too much was pre-prepared and reheated. I definitely wouldn't say someone should go too far out of their way to try Ha Noi. But I did like a couple of things -- the spring rolls and the mixed noodles. And I absolutely loved the prices. It's a decent, non-standard addition to the neighborhood. I'll be back from time to time. 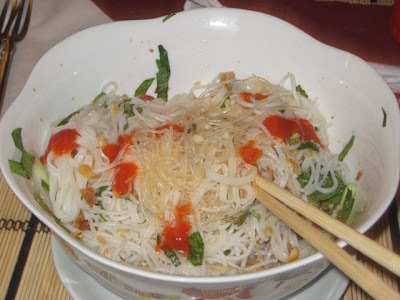 Some might say I know too little about Vietnamese cuisine to fully appreciate Ha Noi. I can only say that in my ignorance, I've learned quite a lot. 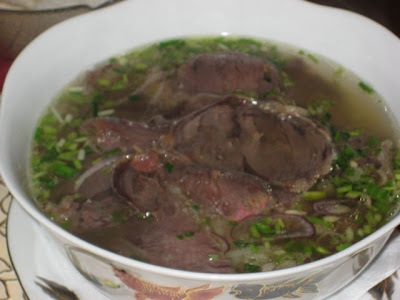 Your bún chả is stupid. I'm Vietnamese and I can tell you loudly: We don't have that weird thing! That's not our Bún Chả!! Cheaters! Viet's right, it really is an aberration and an obvious nod to spag bol.